As usual, we had great fun at our weekly coffee and card sessions, in Towcester and Brackley. I decided to ink up a brand new stamp set called Southern Serenade. I love the clear lines of the main floral image, and the lace panel is stunning - it can be used on top of the flower, as a background or in its own right. On some of our cards we used it around the edges of the card too - giving a nice soft edge when layering the card together. Here were my two samples to start with - a quick photo taken in the evening before! 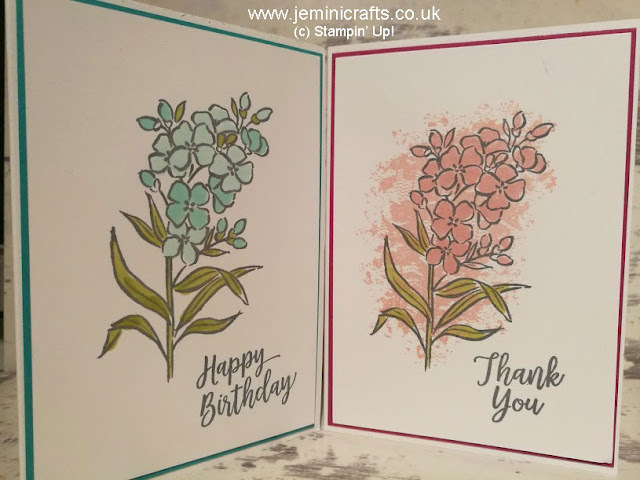 In both cases I coloured the flowers with the Stampin' Up! Blends pens, and in the card on the right you can see the lace background behind the flowers. 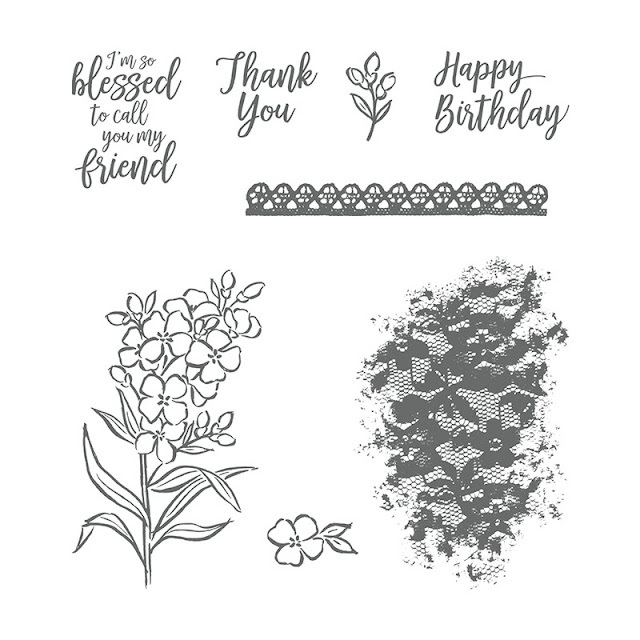 This stamp set has a nice Thank You and Happy Birthday sentiment as can be seen from the cards; but also 'I am so blessed to call you my friend' which is a lovely sentiment to send someone. You can see that the extra little flowers have been added to some of these cards - there is a little bud stamp as well as the little flower. In the card at the top right, you can see the additional lace border - another little stamp you can get SO much use out of. 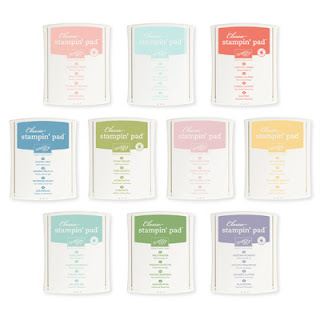 At just £19 for this stamp set (clear mount stamp set); you would get plenty of use for it. 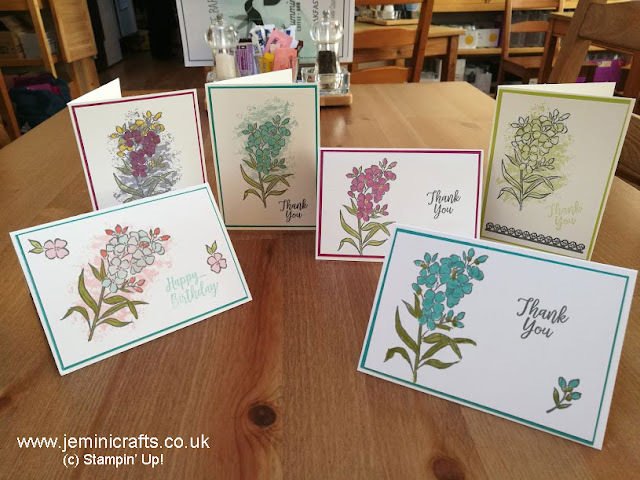 There will be more photographs of our finished cards on my Facebook page - you can hop over and see them anytime - you don't have to have a Facebook account. I used a layer of Whisper White card and stamped the floral design using our Basic Grey Archival inkpad. 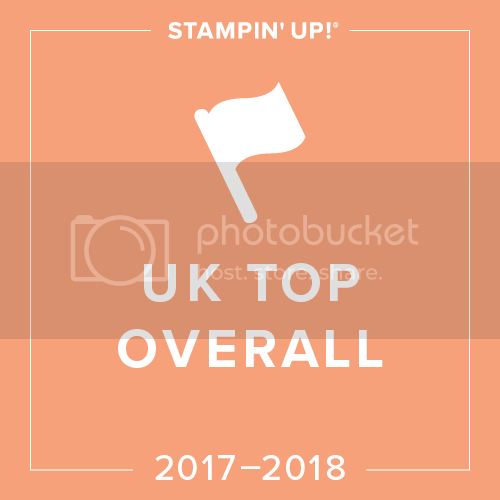 Make sure you are leaving space for your sentiment, at the top, bottom or side of the card. Using Blends pens, colour in the stamped image. As long as you are using the pens lightly, you will find no issues with the ink bleeding. I like the grey ink, it's just more subtle than using a Basic Black or Memento Black Ink. Stamp the sentiment of your choice onto the card. Place a coloured layer of card behind your Whisper White card and then layer the whole thing onto the notecard, using adhesive of your choice - we used either Dimensionals or Multipurpose Glue. 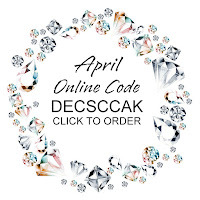 Don't leave out your envelope and your card inside! Add a little flower to the inside of your card, and onto the front or back of the envelope. The lace design would work too.